None of the candidates are not sub-optimal in some form or another. The ANC’s candidate list includes people who have been directly implicated in “state capture” and corruption. While it’s true that they are eligible to be members of Parliament — as Ace Magashule says, “Anybody who has not been found guilty by a court of law is on the list” — you’d hope that the bar would be set higher than “not a proven criminal”. Yes, our President’s hands are tied, after securing a narrow victory at the last ANC Elective Conference thanks to much horse-trading and backroom negotiations. And you could decide to believe that he’s going to take action against corruption once he feels secure in the position, but you’ll be doing so on the grounds of faith, rather than evidence. We’ve had a Cabinet re-shuffle, in November 2018, where it was understandable that he didn’t take significant risks that could create threats to his control over the national working committee and/or national executive committee. So, no cleaning up of the criminal or incompetent deadwood could (barely) be excused. But they are all still there for the May elections. And yes, while the list is the outcome of a democratic process, the importance of demonstrating that we’re truly in a post state-capture era surely justifies some arm-twisting and under-the-table deals, such that it doesn’t include the likes of Gigaba, Dlamini, and Mokonyane. The list (as a friend pointed out this morning) looks the same as a list you would/could have seen in 2014. It gives you zero reason for optimism that anything has changed. There’s no sign of a clean up, of addressing corruption, or holding people to account. Instead, known looters of state coffers are being offered sufficiently prominent positions on the list that they get to carry on earning over R1 Million a year (and they get to carry on staying out of jail). They are also trying to figure out who they are — there’s a libertarian wing, there’s a social democrat wing, there’s an efficient bureaucrat (but don’t talk to me about policy!) wing, and who knows, there might still be a liberal or two around. There are certainly still a few Nats. Which brings us to Mark Lottering, running in disguise as Patricia de Lille. 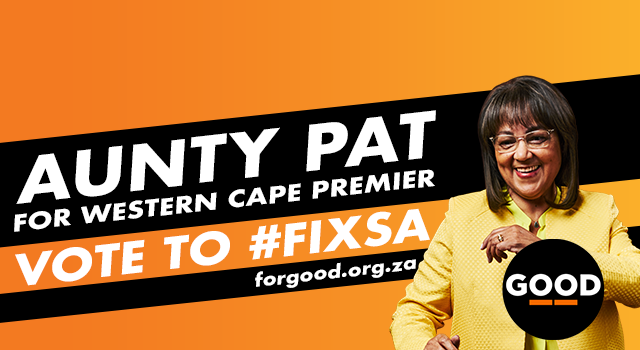 Or vice-versa, but it doesn’t really matter, because “Aunty Pat” will be lucky to get 2% in the Western Cape, and won’t show up in the results anywhere else. The “Good” party is as good as its branding, and its motivations, namely not at all good. We don’t talk about the ethno-nationalism thug party here, although they will unfortunately get a large chunk of the vote, and both the ANC and the DA will again demonstrate that they’ll be anyone’s friend — in various parts of the country, depending on the results — even though that friend has already set your house on fire, and eaten your cat. I had hope for Cope — especially with the sterling work Deirdre Carter has done on advance directives and civil unions — but then they went cosying up to Afriforum, for no reason I can discern except for capturing some small proportion of the already small proportion of white voters. Anyway. We’re in a bad way. The economy is screwed, and basic utilities are failing. There are no good choices in the election, but there might be better and worse choices, and I don’t think it’s at all clear which is which. I don’t think you should should spoil your ballot, as discussed previously. And you should consider voting tactically, including splitting your vote if that makes sense in terms of the likely outcomes. But whatever you do, no choice makes perfect sense. Oh, a friend and I have started a podcast, and our second episode was on this issue, of who we might vote for. Listen to it here if you like.